Mr Reasonable: Is 43p a week too much to ask? Is 43p a week too much to ask? In Barnet we are facing a 3% council tax increase specifically for social care which, as we all know, is in crisis. However, the council had the opportunity to increase the council tax by a further 1.99% to cover all the other services provided by the council such as street cleaning, refuse collection, libraries and children's services. The council have put forward a budget for 2017/18 which shows a shortfall of just under £20 million and that takes into account the 3% social care precept. To balance the budget the council are using reserves, increasing charges and making cuts to services. 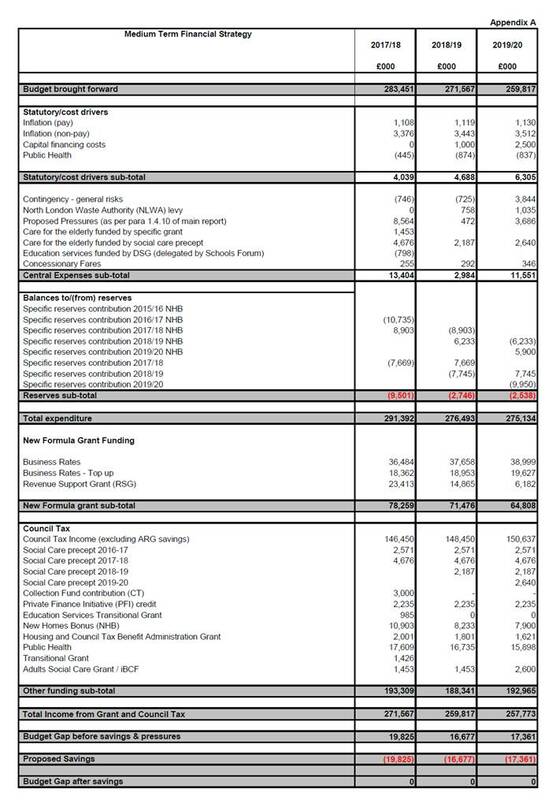 As I am sure many people are aware, adult social care and children's services make up the majority of council costs. Whether local tax payers should be paying for what many see as a national problem is a matter of debate but in Barnet we have the highest number of residential/nursing homes of any London borough reflecting the borough's mature resident profile and that drives demand for social care. Since 2010 Barnet Council have frozen council tax and in 2014 they cut the council tax just before the last election. In the early years there was money from central government to hold down council tax rises which Barnet took but they failed to grasp freezing council tax in one year means that rise is lost every year for ever. At a recent Council Committee meeting I asked the council the cost of a freeze to council tax this year over the next 10 years. 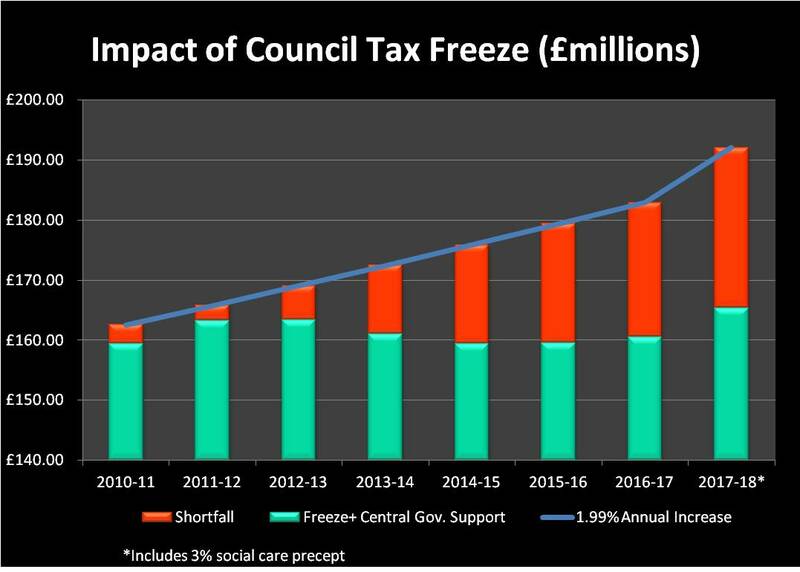 In fact they calculated it incorrectly at £31 million (its actually just under £34 million) but it signifies the impact of a single year of council tax freeze. When you look at the impact over 7 years the difference is significant. Some people, including Cllr Cornelius, may argue that council tax is a regressive tax but there is banding by property value and there are also approximately 30,000 households that receive some form of Council Tax discount or exemption. Even setting aside the growing demand for adult social care, inflation alone adds over £4 million a year to costs and includes, for example, the automatic inflation clauses included in the Capita contract. If the council had increased council tax this year by the 1.99% allowed by government (in addition to the 3% social care precept) it would have cost the average Band D household the princely sum of 43p a week. It wouldn't have stopped all of the cuts but if the council had taken modest increases of 1.99% each year since 2010, then there wouldn't be a £20 million shortfall this year. One question I asked the committee was, "Do the council think residents would prefer cuts or a 43p a week increase?" to which Richard Cornelius said that was a political decision and that is undoubtedly true. I speak to many residents who would prefer modest increases so long as it is spent on frontline service but they are never asked that question. However, in Barnet, the council are happy to spent an extra £800,000 on additional PR staff. They are prepared to spend £400,000 a week on interim and agency staff. They are prepared to pay Capita millions for 'special project' consultancy work. They are prepare to spend £360,000 a year on both a Chief Executive Office AND a Chief Operating Officer in a commissioning council where many of the services are outsourced. In 14 months time we have another council election. I just hope the electorate see through this shortsighted strategy which damages council services in both the short term and the long term but then again some people my just read the headlines of council tax freeze and not give a damn about how that affects services.